Have organizations been successful in adapting, or reinventing, their traditional approaches to InfoSec and AppSec to the realities of DevOps? Can security keep up with rapid iteration in continuous deployment? 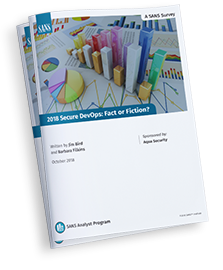 Is Secure DevOps fact or fiction? "This SANS survey indicates that fewer than half (46%) of survey respondents are confronting security risks up front in requirements and service design in 2018—and only half of respondents are fixing major vulnerabilities." Read more - get the report today!